Incuse on the edge: TOTUL PENTRU TARA inscription "MIHAI I REGELE ROMANILOR" meaning "KING OF THE ROMANIANS", MIHAI I head facing left. The order of melting the entire batch was issued before the release, yet - as usual - some survived to make up a special challenge for the Romanian coin collectors. 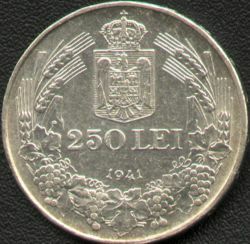 The coin picture at left is present on Romanian Coins through the kind permission of Mr. J. Ardelean. The piece above has digit 1 stamped above the year. One legend says that in 1945 Haralamb Ionescu, the coin engraver, struck a second batch of only 10 or 12, that he numbered. 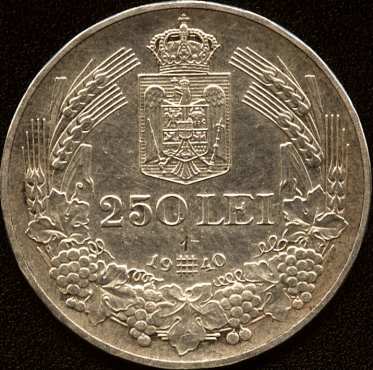 The 250 lei coins struck under Mihai differ by the inscriptions they have on the edge. The ones featuring NIHIL SINE DEO (NOTHING WITHOUT GOD in Latin) as well as the ones with TOTUL PENTRU TARA (meaning ALL FOR THE HOMELAND) that entered circulation were struck in 1941. 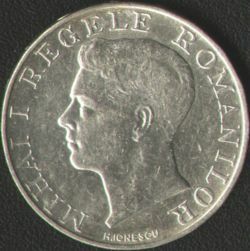 As a second distinction besides the edge engraving, inscription 1941 on the value bearing face is not guarded by two wavy lines on the TOTUL PENTRU TARA coin and thusly unlike to the NIHIL SINE DEO variant (previous page). The pictures of the incuse inscription (see above) show that three identical signs were used to separate the words. Clearly, the sign is the emblem of the Legionary Movement. The coins bearing this emblem on one side of theirs were melted. Why were these coins released to circulation? It is very hard to believe that nobody knew about the sign on the edge. In monograph Monede şi bancnote româneşti the coin is described in full detail, but the sign on the edge is mistakenly considered to be a square. In the table with separating signs on the edge this ensign is missing completely.